Plastic Welding - BumperNow Plastic Welding Inc.
BumperNow specializes in plastic welding. We’ve been doing it for over twenty years! 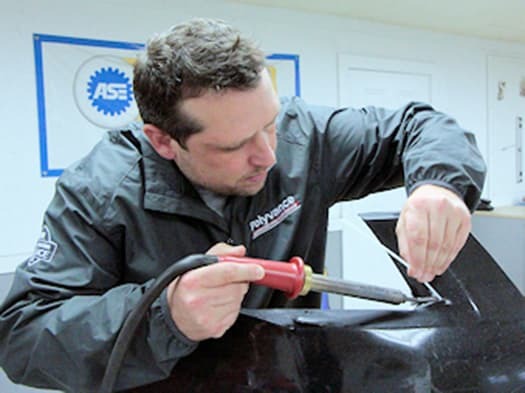 Using Nitrogen, specialty tools, and over decades of experience, our technicians can plastic weld and fuse almost anything plastic, not just bumpers. Whether it’s a cracked plastic part, motorcycling fairing, dirt bike, ATV, agricultural tank, golf cart, kayak, canoe, or sea doo / ski doo, we can probably repair it. To learn more, please contact us a description of your project and any relevant photos and we be happy to assist you with your plastic welding needs. We are also able to supply you for all your plastic welding needs. This includes plastic welding rods, equipment, expertise, training, and primer. Please contact us for more information and pricing.